When the change of season was on the horizon I started searching for some new patterns or colors of fabric to create clutches out of. And I searched some more, patience was key - Couldn't be more excited with what I found!!! Landed great new patterns, colors and styles of materials for some new clutches. At last they are sewn and ready to be listed!!!!! Here is the first release of new clutches...Bronzed and Glimmery. Black/White Graphic. Gold Sequin Dots. Bronzed & Glimmery is a super soft pebbled faux leather that has an added matching Zipper Pull! What do you think???? The Bronze & Glimmery is a personal fav! And not to worry if you were looking for some repeat styles those are there too! I'm so excited that I am finally ready to share these with you!!!! Make sure to grab yours quick and not to worry I will remake more if they sell out! SHOP HERE. I love the bronze clutch! It's the perfect color for fall. Love these! The bronze clutch is absolutely amazing! I love the black and white graphic!! You're so talented, Taylor!! Eeeep! I loooove the new bronze one with the purple zipper, make a bunch!! Taylor, I LOVE them! The black-and-white graphic ones are gorgeous. great post!!!! love the metallics! Taylor that gold sequin dot one is gorgeous!! loooooving them. need one. now. I love the sparkly one!! Yay! So exciting, headed to check them out now! ahhh so many great picks! LOVING the metallic one!! I love, love, LOVE the black and white graphic!! If I wasn't trying to not spend money ($500 plane ticket to Puerto Rico recently purchased!) I would be all over that one! Love the new clutches. So cute! wow! already sold out of the two black and white prints! can't wait till you make more of the one with the blue zippers :). um hellooooo gold sequin dots!! black/white combo is deeelish too. you have serious skills sister! You are one talented lady! I LOVE the bronze! Def my fave! Though the black & white print one is a close second! Just lovely! Noooooooo...Did I miss the boat? I NEED a black and white graphic! I love these! You're so talented. The black and white one is my fav. 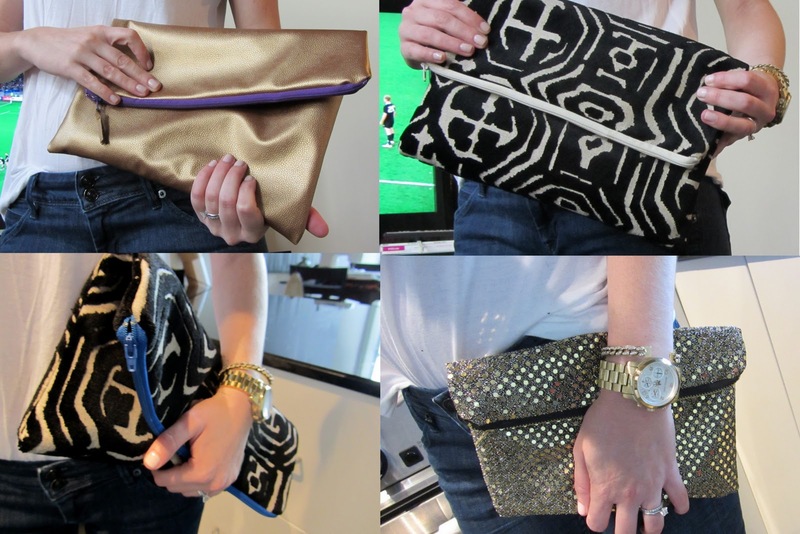 Taylor, I love your clutches! This summer, I actually purchased an electric blue one with a bright pink zipper that you made. I get complimented on it all the time. Your new collection is wonderful too. Keep up the great work!!! Just found your blog through Grace at Stripes & Sequins! I absolutely love these bags!! I love the clean lines with the great fabrics, can't wait until more are available on Etsy.